I got this monster from my furniture restorer friend. It looks as though it had water damage because of the fact that the veneer is falling off. However, the inside looks as though it was in a humid environment, like someone's basement. I think it was also too close to a furnace, because the tuning chassis which is metal is bent out of shape as though it had been heated and cooled often, warping its shape. Also as I began washing the wood, it had the distinct smell of fire. Below are some pictures of the radio chassis. It is a TRF circuit with a separate audio amplifier. It is strictly an AC circuit. 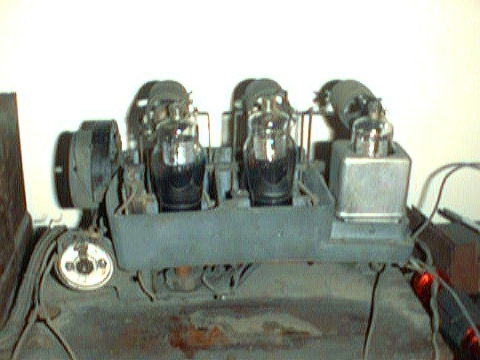 The tuner section is a three stage TRF using the 24A screen grid indirectly heated cathode tube for superior performance and AC operation. 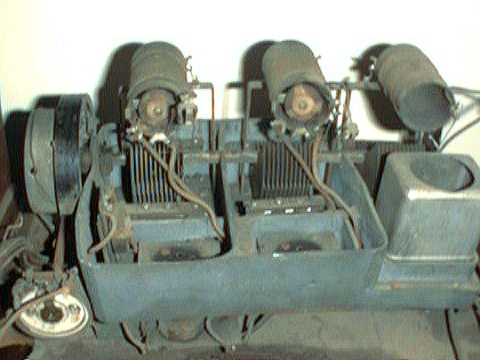 The circuit has three coils mounted on top of the ganged (for single knob tuning) tuning capacitor and coils all over the place. I suspect that the performance of this animal is going to be top notch. It uses a nicely elaborate tuning scheme that uses both gears and tuning cord which is actually still there and intact. Strangely enough it is still strong. It also has a back frame on the cabinet that snaps in place with a cloth cover (no cloth, but it had one) for safety. One thing I deeply appreciate about this model is the tuning indicator strip. It is made of metal and has the log and frequency stamped out so light from behind could shine through and appear on an opaque piece that has an arrow on the escutcheon. At least I don't have to locate one of those! Stephen J. Flack has kindly emailed me with a find of his which resembles this one with the exception of having longer legs, so I am labeling this one also as a 550. 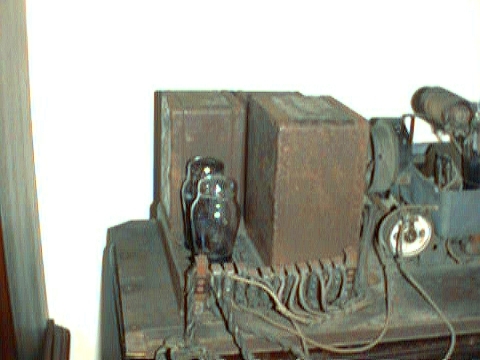 The amplifier chassis serves the purpose of both amplification and power to the rest of the radio. It consists of two transformers (as far as I can tell) or one transformer, one choke and one filter capacitor. They are in boxes that resemble cookie tins. 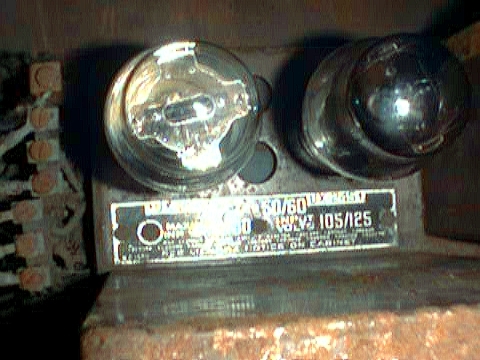 The amp is the 45 directly heated power triode and an 80 rectifier. I wonder why the 45 was used and not a 41 or 42 indirectly heated pentode? Perhaps the 45 was cheaper and more available. Now they are rarer and most expensive. Looking under the chassis I saw a couple of other coils (possibly for isolation of the RF sections) and two large resistors and three or four smaller resistors. The wiring still looks good as new (possibly kept that way by the humidity. You can still see the colors) and neatly tied together with cord. Amazingly, this radio came with all of the tubes intact and working and a spare 45 (globe!!!) and 24A, as well as a box of dial lamps in the original box. I also have a box for one of the 24A's! They are all Wizard brand tubes. But the Graybar radio is an RCA subsidiary. This is going to be one heck of a restoration project I found a compatible schematic on Nostalgia Air. It seems to be the RCA models 44, 46, and 47. The label on the mounting board is missing and the cabinet has no other marking than the name on the escutcheon plate. There is also no speaker. However I have purchased an AK model F5 speaker that I think will work with it either mounted inside in the available opening or on top. Since the 45 amp is a parafeed (an audio choke load and a coupling cap to the speaker, which likely would need its own coupling transformer) I suspect the sound will be interesting, if not surprising fidelity. I have found scraps of the original grille cloth and it appears to be flowers in a flower pot. I might be able to find similar embroidery at my local fabric store. I also may be able to get away with using a permanent magnet speaker since it seems that the power supply has a filter choke. I will have a picture of the cabinet as soon as it is completed. See how the chassis bends? I removed the pot metal and the steel (?) below it straightened back up. I will, if I cannot find someone to make a new one from aluminum, simply use brackets and stand-offs. The above two pictures are of the power supply/amplifier module. This is the cabinet stripped of the Escutcheon and knobs. The grille cloth was orange in color and has a floral image. I can tell because when I removed the speaker board it had the edges of the cloth intact with the outer edge of the picture. That will be difficult to find. This is the rear of the cabinet. The frame also had some cloth on it.